If your child has been diagnosed with atopic dermatitis (eczema), food allergies, asthma, or other conditions, it can be tough to understand how these conditions interact with each other, and how they came to be in the first place. As a parent, having a child with a medical condition can be stressful, and we are here to help! Our team of experienced and highly-trained professionals can help you navigate daily life and offer better insights into the causes and remedies of your unique symptoms and condition. Does Eczema cause other Problems? One study investigated whether early allergy sensitivities increased the progression to other conditions. 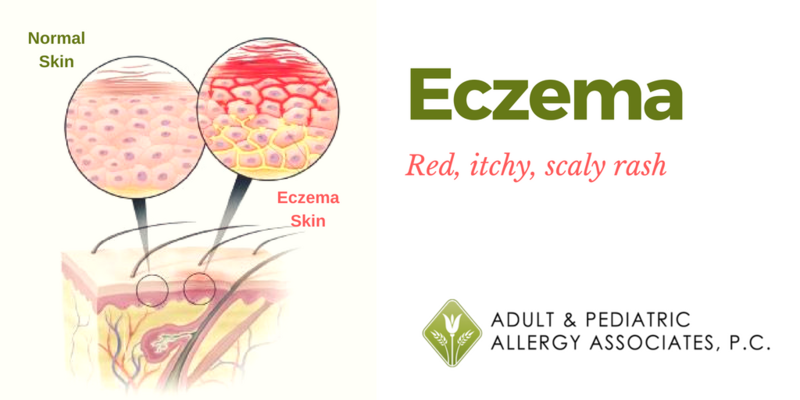 What they ultimately found was that children who developed eczema during infancy and who also had allergic sensitizations (such as an allergy to food) were 7 times more likely to develop other conditions, like asthma, in later childhood. They also concluded that children with dual conditions were also more likely to develop other conditions such as food allergies and allergic rhinitis (hay fever) for example. 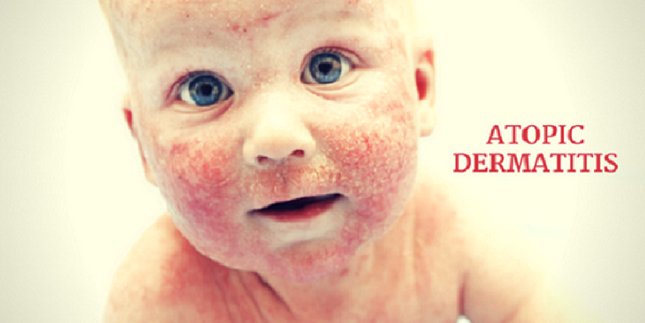 However, this study also concluded that if a child developed eczema without any other allergen sensitivities by their first birthday, they would be at a lower risk of developing asthma or other allergy-associated sensitivities in later childhood. These conditions are thought to be caused by an irregularity of the gene encoding filaggrin, which is an important skin protein. Unfortunately, this type of genetic testing isn’t readily available in most clinical practices, so alternative approaches for diagnosis may be needed. What Can Be Done for Children? Here at Adult and Pediatric Allergy Associates, we understand the discomfort and anxiety that allergies such as atopic dermatitis can bring into your and your children’s lives. Our desert environment, along with foods and even a lack of sufficient allergy awareness plays a major role in the rising number of allergic attacks throughout Arizona. And as you can see, the more we prevent allergies from starting, the better it can be for our growing children! Our top-rated Phoenix allergy and asthma specialists can help you and your child better understand and manage your allergy symptoms, including the underlying causes and triggers with comprehensive allergy testing here in the Valley. With over 20 years of experience and 5 clinics across the valley, you can be sure to find the absolute best treatment plans for patients of all ages. If you are tired of the effects of persistent allergic reactions contact us at 602-242-4592 today and discover Adult & Pediatric Allergy Associates, P.C. can help! Egg allergy is caused due to our immune system reacting against the proteins in the egg – usually found in the white part. It is particularly seen in younger children starting from 6 months of age. Egg allergies can be either permanent or transient – in transient cases, children outgrow their egg allergy. Some people have allergic reactions to egg upon skin contact but can ingest it because gastric digestion reduces the allergen of the egg proteins. Sometimes egg proteins can be resistant to the heat and digestive enzymes in the stomach causing an immune response. For children with allergies, the reaction is usually within minutes to a couple of hours of ingestion of egg, with symptoms such as hives or swelling. Skin symptoms are most common, but other immediate reactions involving the gastrointestinal or respiratory tracts are also seen. Egg allergy has been implicated as a trigger for atopic dermatitis. Children who have egg allergies with atopic dermatitis response are more likely to develop asthma. The severity of the allergic reaction varies from person to person, from episode to episode. Anaphylaxis can be life-threatening, and infants and children who are asthmatics are particularly at risk. Fatal incidents are few, but have occurred. Allergic reactions are milder when ingesting cooked denatured egg, but stronger in case of eating raw or undercooked egg. Gastrointestinal inflammatory reactions are also present in some children showing up as allergic eosinophilic esophagitis. Avoiding eggs – this can prove difficult as egg whites, shells etc. are in so many products including medicines and vaccines. Being vigilant becomes important. For patients with a history of severe allergic reactions, having an epinephrine autoinjector at hand always. 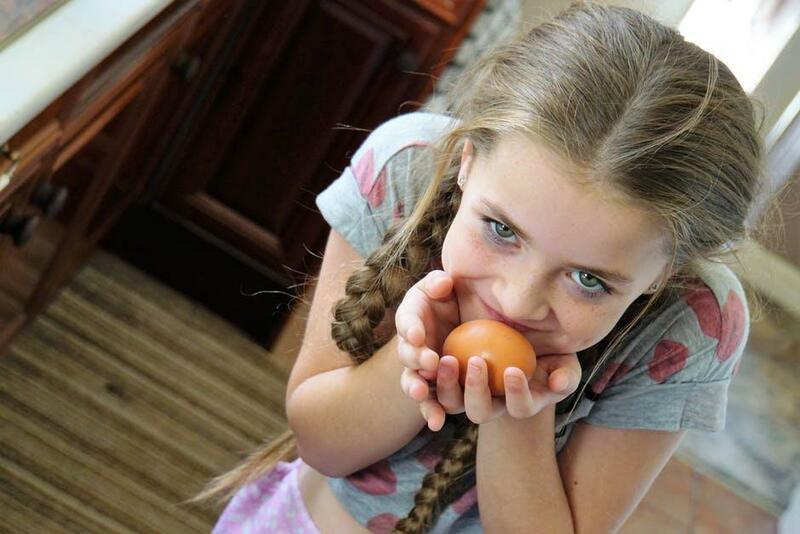 Some studies have suggested kids fed egg at 4-6 months of age were less likely to develop an egg allergy. When it comes to the adult population, occupational asthma has been seen in populations which work in egg factories or bakeries where egg is used commonly in aerosol form.